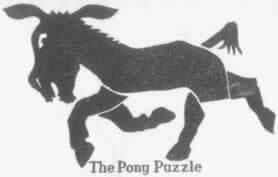 I've put Sam Loyd's Cyclopedia of 5000 Puzzles, Tricks, and Conundrums, sometimes called the Cyclopedia of Puzzles, entirely online. You can view individual pages, or download a zipped file of the entire book. I could perhaps close the column there, due to fame of the Cyclopedia, heretofore unavailable online. Take a look. How famous? 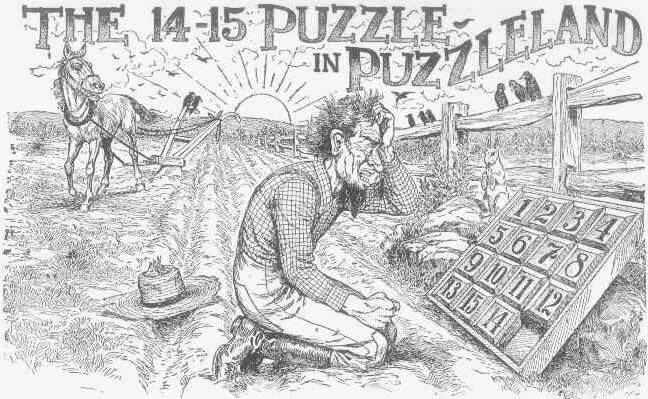 Based on the Cyclopedia, Martin Gardner titled one column "Sam Loyd: America's Greatest Puzzlist," and put together the 1959 recompilations for Dover, Mathematical Puzzles and More Mathematical Puzzles. Don Knuth has made a careful index of the Cyclopedia's contents. Loyd is mentioned in the MacTutor History of Mathematics. Will Shortz has the following to say: "Despite all its flaws, Loyd's Cyclopedia is still probably the most important and exciting puzzle book ever published." Figure 1. 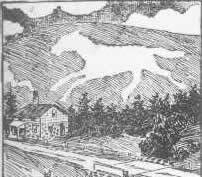 White Horse by Loyd, White Horse as it really appears, The Pony Puzzle. The Boarding house Pie (page 18). Slice a circular pie into the maximal number of pieces with 6 straight lines. The Puzzling Scales (page 20). An Elementary Lessons in Algebra. The Patch Quilt puzzle (page 39). This in the Mrs. Perkins's Quilt problem. The Necklace Puzzle (page 48). What is the most inexpensive way to fix the necklace? Puzzleland Park (page 61). There are eight houses in Puzzleland Park, and the people of each house much only go out of their private gate directly across, on a line with the door of their own house. Each family has a private path of their own leading to their gate between a row of trees; no paths cross any other paths; no inmates of one house ever meet any of their neighbors, so they never quarrel about which should turn out for the other in Puzzleland. Some of the paths are crooked and very funny, but as each one has a map marked out by the landlord, who is a great puzzlist, they never get lost. The Deaf and Dumb Alphabet (page 64). A story coded in the American Sign Language alphabet. The Betsy Ross trick (page 69). How to fold and cut a 5 pointed star. George Washington originally asked for 6-pointed stars, but Betsy Ross knew how to cut 5-pointed stars, and convinced George that they would look better. The Moving Day puzzle (page 82). A difficult 2x3 Sliding Block Puzzle. Nick Baxter Sliding Block Puzzle page has a version of it. The Boxer Puzzle (page 104). Likely the first puzzle for Dots and Boxes. For a modern analysis, see the Elwyn Berlekamp book. Picket Posts (page 105). The "no 3 in a row" problem. Back From the Klondike (page 106). In recent years, Robert Abbott has greatly improved this maze type. Fore and Aft Puzzle (page 108). A peg-jumping puzzle. The Domino Puzzle (page 112). In the game of Muggins, whenever the ends total to a multiple of 5, you score that many points. Show a game with a score of 200. Peaches, Pears, Persimmons, and Plums (page 126). Obtain 5 rows of 4 in a row, 4 times, on a limited grid. The Joiner's Problem (page 152). One of many dissection problems studied by Loyd. The Bridges of Konigberg (page 155). Loyd retells the tale of Euler's problem. The Switch Problem (page 167). Show how to exchange the trains. The Gingerbread Dog (page 178). Divide the cookie into two identical shapes. More similar dissections have been made by Mineyuki Uyematsu and Michael Reid. A Lip-Reading Puzzle (page 190). 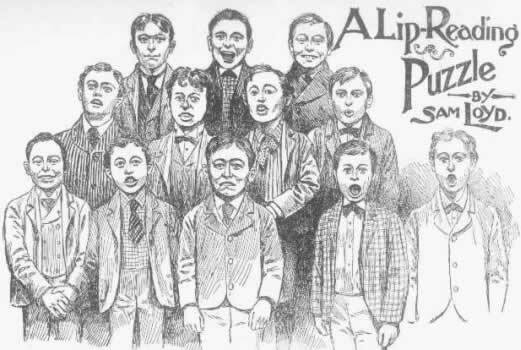 "Here is a class of a dozen boys, who, being called up to give their names were photographed by the instantaneous process just as each one was commencing to pronounce his own name. The twelve names were Oom, Alden, Eastman, Alfred, Arthur, Luke, Fletcher, Matthew, Theodore, Richard, Shirmer, and Hisswald. Now it would not seem possible to be able to give the correct name to each of the twelve boys, but if you practice the list over to each one, you will find it not a difficult task to locate the proper name for every one of the boys." 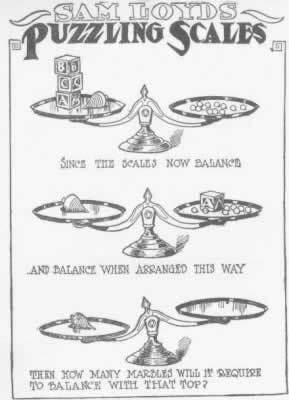 The Tower of Hanoi (page 223). The Rip Van Winkle puzzle (page 232). Now called the game of Kayles. The 14-15 Puzzle (page 235). The most famous sliding block puzzle of all time. 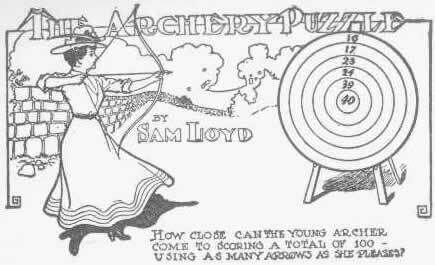 The Archery Puzzle (page 244). 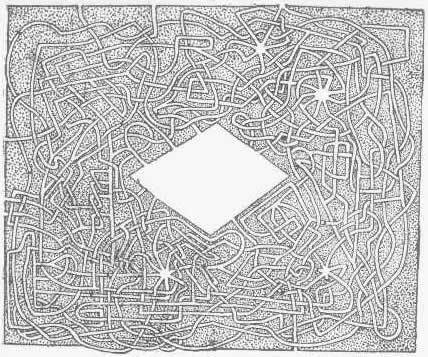 The Lewis Carroll Maze (page 261). The Endless Chain Puzzle (page 280). Pack a continuous chain back into the box. The Lost Star (page 318). Find the hidden star. Get Off the Earth (page 323). When the disk is rotated, a person disappears. That's a taste of Loyd's Cyclopedia. For more, see the page of thumbnails, or Knuth's index. Now that I've perhaps convinced you of the book's greatness, let me mention the flaws. The book has mistakes, hucksterism, and the racism that was part of Loyd's day. I've censored none of it -- a school student can perhaps use the book as an example of racist caricature. One example of a mistake/exaggeration comes from Will Shortz: "The claim that the book contains 5,000 puzzles is hugely overblown. Once I went through page by page, and making a generous count (treating, for example, every riddle, every question, and every element of a rebus as a separate puzzle) could come up with only about 2,700." See Martin Gardner's two books for more corrections. Loyd claims should be taken with a grain of salt. 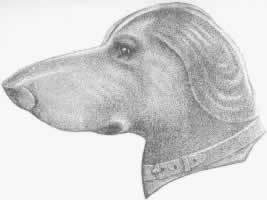 For example, his Trick Mules puzzle was originally published as The Dog Puzzle in The Magician's Own Book in 1857 (when Loyd was 16). For tangrams, he wrote The Book of Tan as a scholarly work, but the entire volume was a hoax. He may not have invented the 14-15 puzzle -- The New York Times fails to mention him in their discussions of that particular puzzle craze. Warts and all, I put the scans of Loyd's Cyclopedia into the public domain. Nick Baxter, "The Moving Day Puzzle by Sam Loyd," http://www.johnrausch.com/SlidingBlockPuzzles/moving.htm. Alexander Bogomolny, "Can you better Sam Loyd?" http://www.cut-the-knot.com/pythagoras/Plato.shtml. Barry Clarke, "Sam Loyd and his Priority Claims," http://homepage.ntlworld.com/barry.r.clarke/zsamloyd.htm. Greg Fredericksen, Dissections: Plane & Fancy, Cambridge University Press, 1997. 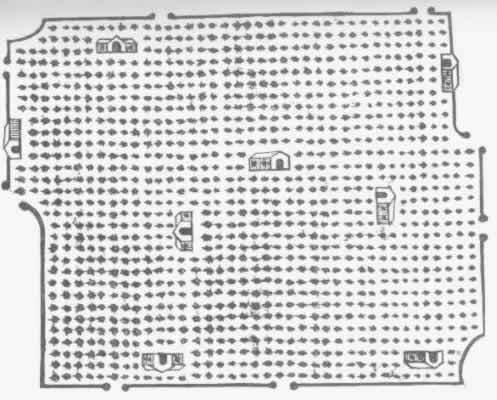 Martin Gardner (ed), Mathematical Puzzles of Sam Loyd, Dover Publications, 1959. Martin Gardner (ed), More Mathematical Puzzles of Sam Loyd, Dover Publications, 1959. Mark How, "Uffington White Horse," http://www.hows.org.uk/personal/hillfigs/uff/uffing.htm. Otto Janko, "The Retrograde Analysis Corner," http://www.janko.at/Retros/index.htm. Don Knuth, "Math puzzles in Sam Loyd's Cyclopedia," http://sunburn.stanford.edu/%7Eknuth/loyd-cyc.txt. MacTutor History of Mathematics, "Sam Loyd," http://www-groups.dcs.st-and.ac.uk/~history/Mathematicians/Loyd.html. Sid Pickard, The Puzzle King: Sam Loyd's Chess Problems and Selected Mathematical Puzzles, Pickard and Son Publishers, 1996. 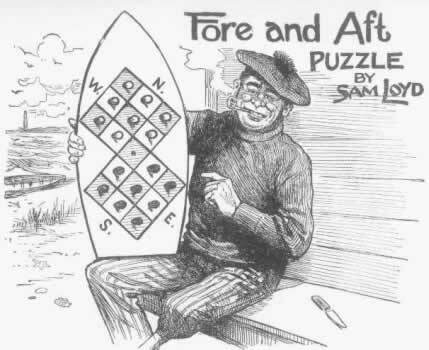 David Singmaster, "Some History of Two of Sam Loyd's Puzzles," http://www.g4g4.com/MyCD5/SOURCES/singmaterial.htm. Thinks.com, "Classic Puzzles of Sam Loyd," http://thinks.com/puzzles/loyd/loyd.htm. Eric W. Weisstein. "15 Puzzle, Tower of Hanoi" From MathWorld--A Wolfram Web Resource. http://mathworld.wolfram.com/. Ed Pegg Jr. is the webmaster for mathpuzzle.com. He works at Wolfram Research, Inc. as an associate editor of MathWorld, and as administrator of the Mathematica Information Center.